Air source heat pumps are a clever way of using the air's heat to warm buildings and heat up water. Air Source heat pumps are an ingenious way of using the air to heat buildings. Essentially they act like a reverse refrigerator. In a fridge, you extract heat from the air inside and make the interior cool, while the pipes at the back heat up: heat pumps take heat from air, the ground, or water and pump it into a building, thus warming it up. It's using physics in a clever way to create warmth, while reducing environmentally damaging carbon emissions, and more importantly to some people, cutting energy bills. What can you use Air Source Heat Pumps for? The heat they generate can be used to heat radiators, underfloor heating systems, or warm air convectors and deliver hot water in homes, office or retail buildings.They are most suited to houses that don't have access to mains gas, and the household is using oil or LPG fuel. In this scenario, you might see a 50-60% cut in your heating bill. With the UK government offering an ｣850 ($1330) grant to contribute towards the installation costs through the Renewable Heat Incentive then it's a great time to take advantage. 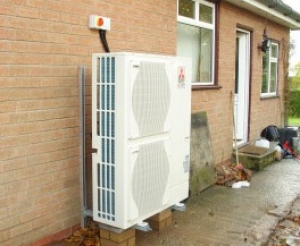 As Air Source heat pumps need electricity to work, the cost savings are dependent on the electricity prices so it is difficult to give exact figures on savings and they also depend on what heating source is being replaced. Macclesfield Renewables are a small family-run business, who offer free, independent advice on what is best for each customer on renewable energy systems. Kier Wilkinson, their Sales and Marketing Manager, says, "We aren't interested in the hard sell. We are extremely focussed on what is best for our customer and forge strong working relationships with everyone who work for. With 20 years of experience in the heating and plumbing industry, our technical knowledge is second-to-none and all our installations are completed to highest standards." On the Macclesfield Renewables heat pump installation site it gives out a few examples with savings going up to £610 ($950) per year, depending on the heating source being replaced. An average saving for domestic use would be in the £300 ($470) region. They recommend Vaillant air source heat pumps, having worked with for many years, installing high efficiency boilers and solar thermal systems. During that period Vaillant has proved superior in terms of reliability and performance. They also install the Mitsubishi Ecodan range of air source heat pump systems which have been developed by Mitsubishi Electric specifically for the UK and which bring advanced, inverter-driven technology refined in the commercial heating sector to home systems. The reduction of emissions also varies, calculations on Macclesfield Renewables suggests CO2 savings of 30% over gas and 50% over oil, which is a significant amount if you are concerned with saving the planet from the climate changing effects of Carbon Dioxide emitted into the atmosphere. If your electricity was generated from a totally renewable source, then the CO2 emissions would be negligible. Unlike a ground source heat pump, you don't need to dig up your garden! Air Source heat pumps just have to be installed properly by a qualified technician, and then they need little maintenance. They aren't quite as efficient as the ground source version but are more versatile, and no lawn to re-lay. From 2016, new build houses in the UK will not be permitted to install gas boilers to encourage carbon neutral homes, which means that there will be a big need for heat pumps in the domestic market. Kier Wilkinson says, "We are getting ready for the future by investing in the technology and the skills-base now."